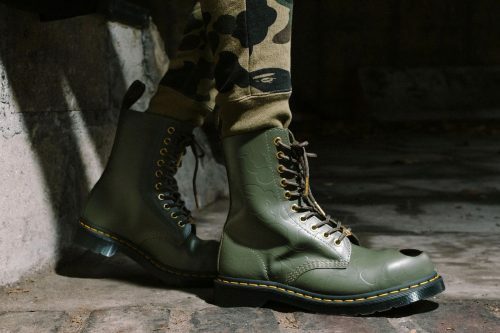 Dr. Martens has joined forces with leading Japanese streetwear brand A Bathing Ape (BAPE) to launch a capsule collection featuring reworked Dr. Martens styles – the 1490 boot and the Petri shoe. The two classic Docs styles are embossed with BAPE’s signature 1ST CAMO pattern, in either black or an army green colorway. 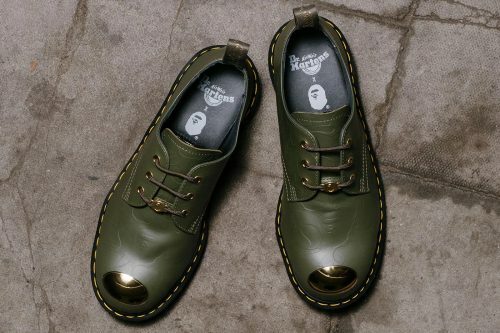 Each style also features a golden steel toe paired with gold eyelets and lace locks. The Dr. Martens x BAPE collaboration will officially drop at Dr. Martens webstore on 15th December, take advantage of the free domestic delivery in UK by sending your order to our UK warehouse.